Text excerpt from: "Jerusalem readies for Bush's arrival"
IHT: "Not every Israeli will welcome him with open arms. 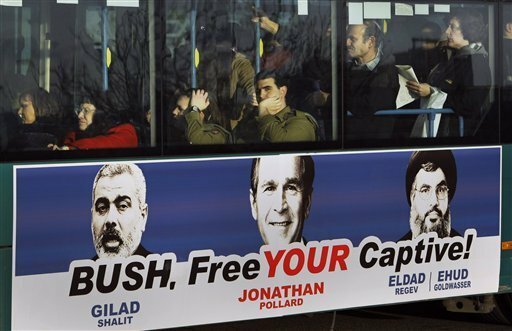 Supporters of convicted Pentagon spy Jonathan Pollard have rented space on the sides of Jerusalem city buses to place posters of Bush flanked by Lebanese Hezbollah leader Hassan Nasrallah and Gaza Hamas leader Ismail Haniyeh. The posters compare the imprisoned Pollard to three Israeli soldiers captured by Hezbollah and Hamas and call for the immediate release of all four. in a U.S. federal prison."